The Charlotte Observer recently reported that, in late October 2017, lanes of traffic were closed on parts of Sixth and Fifth streets to create protected bike lanes.This was done as part of a pilot program to evaluate the feasibility of making protected bike lanes permanent. The idea is to create corridors of car-free traffic for bicyclists in an effort to prevent bike accidents. So, dedicated bike lanes may be coming soon to Charlotte. But along with new bike lanes, there will be more bikers and a likely increase in personal injuries and fatalities. Here is what you need to know and a few tips for being a safe cyclist and avoiding bike accidents while you travel in North Carolina. Accidents involving bicycles are much more likely to be deadly than accidents involving only vehicles. Already in 2017, there have been many cyclist fatalities here in Charlotte. In January, a cyclist was struck and killed by a car on Monroe Road. In June, a 29-year-old Charlotte man was riding his bicycle on Matheson Avenue when he was hit by a car. The man died the following afternoon. The driver was a 23-year-old woman who was charged with driving while impaired, felony hit-and-run, felony death by motor vehicle and other charges. And just a few months ago in September 2017, another bicyclist was killed when two cars collided sending one car careening into the cyclist. The cyclist was pronounced dead on the scene. Cyclists have obvious and unique risks when on the road with cars and trucks. Cyclists lack crash protection provided by cars and the differential in mass is enormous between a human being on a bike and a steel-framed metal machined car, truck or SUV. Cyclists are very likely to be killed or seriously injured when struck by a vehicle. When a vehicle strikes a cyclist, it is often straightforward to prove the negligence of the driver. However, a cautionary note is in order concerning the doctrine of contributory negligence for bike accidents. North Carolina has a pure contributory negligence system whereby a victim of an accident is completely prevented from recovering any compensation in a lawsuit if the victim is found to be even a little bit at fault for causing the accident. Obviously, a pure contributory negligence system favors the defendant and insurance companies. 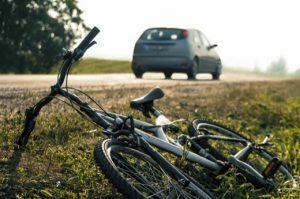 With that in mind, here are few tips for biking safe and avoiding the potential of contributory negligence if you are struck by a car. Brown Moore, & Associates offers safety tips to help prevent Charlotte bike accidents. Wear helmets — it is common-sense that wearing a helmet protects the cyclist in case of a collision with a car or truck. The helmet should fit properly and be securely fastened. Use hand-signals to signal turning. Give audible warning to pedestrians before passing. Use lights at night — this is common-sense, but many cyclists fail to get headlights for their bicycles. In cities like Charlotte, there are plenty of street lights. So cyclists think headlights are not needed. The opposite is true. A white lamp is needed which can be seen from 200 feet to the front and a red lamp should be affixed to the rear which can be seen from 300 feet. Keep all reflectors in good condition — likewise, your bike should have several reflectors on the front, back and in the spokes of the wheels. At night, these can be seen in the headlights of vehicles and, thus, provide warning and make it safer for you. Only one rider — most bicycle are designed to carry only one person at one time. Being safe means only having one rider. Carry child only in proper devices — if you are carrying a child with you, proceed with extra caution, avoid areas of high vehicular traffic and make sure you have a sling or a child seat or a trailer designed and approved for carrying children. No dogs — if you are cycling on the roads and/or where traffic can expected, leave your dog at home. If the pet is small, make sure it is secured in a closed pet carrier which is itself secured to your bike. No texting or use of smartphones. No biking while drowsy or on medications that might make you drowsy. Following these safety tips should make your cycling experience safer and should help avoid any bike accidents with vehicles is important to rebut any claims of contributory negligence. The insurance companies always try to blame the cyclist to avoid having to pay. Do not give them ammunition. Collisions involving bicycles are often the most deadly and severe. The only comparable cases are ones involving massive tractor trailer trucks smashing into cars. If you have been injured while biking, you are going to need proven lawyers like those at Brown Moore & Associates. The firm of Brown Moore & Associates has dedicated attorneys who have been handling personal injury and accident cases for Charlotte residents for over 40 years. We care about our clients and our community and care about getting fair and full compensation. We attempt to reach a fair settlement with the insurance companies, but if the case goes to trial, we will fight and fight aggressively. Contact our office today to schedule your free consultation.